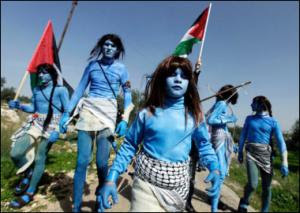 On February 12, at the now regular demonstrations and clashes in the town of Bilin, pro-Palestinian demonstrators appeared in blue body paint as the Na’vi—the film’s indigenous people who are threatened by the human corporate mining of “unobtainium.” Among those reenacting the parts of “Na’vi” were Palestinians, Israeli activists, and Europeans. As the Bilin demonstrations have been going on for almost five years and have attracted the attention of the international media, the photos of the blue-painted demonstrators were seen around the world. Whatever the politics and whatever you think of the movie, this is a fantastic use of a cultural phenomenon. The article is actually quite good and places the the use of Na'vi with other cultural reference in the conflict, including that of David and Goliath. Read the full article here. CFV 426 - Avatar/Pocahontas Mashup FINAL VERSION from Randy Szuch on Vimeo.